It all started when my head gasket started to leak antifreeze. I knew then that racing at Lime Rock took it's toll on the engine. Whenever the car has needed something replaced, I have always replaced the part with something that adds horsepower or improves the car. This head gasket job gave me the opportunity to change the cylinder head with something a little better than stock. A 2.1 litre non-turbo head is one option available. This head has bigger intake ports which can allow more air into the cylinder on high power applications. Everything else is pretty much the same. 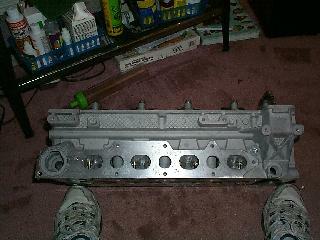 In order to really get the benefits of the 2.1 you also have to get the 2.1 intake manifold. This manifold also has bigger ports to match the air. In the picture below the yellow intake is a stock 2.0 intake manifold, you can see where the injectors dip down into the ports. 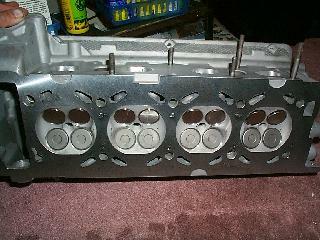 With a 2.1 head, the injector holes are raised up giving the port more space. To complete the swap, you should also pick up the 2.1 fuel rail and fuel regulator mount. The 2.0 throttle body works fine. I called up my friend at the SAAB Depot and told him I was looking for a 2.1 head and intake manifold. He had one and sold it to me for a reasonable price. He said it was original and needed to be rebuilt. That was fine since I was going to have it rebuilt no matter what. You have to be careful when buying used heads. If they have been planed before, they may not be rebuildable. Always look for an original head with no rebuilds. This gives you some room to plane if the head is warped. I called Stephen at Lesco in California and started talking about the head job. I ended up getting a full blown performance head. I guess that's what I'm looking for as we were talking. It has new sodium exhaust valves, higher rated valve springs and 4 hours of hand porting/polishing. I sent everything to Lesco. 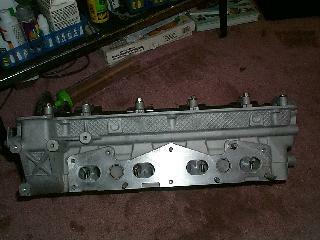 Head, intake manifold, and exhaust manifold. After just 1 week, I got everything back. Wow, that was quick! Stephen was able to order everything while I shipped the stuff to him. This made the turn around time very quick. In addition to the head, I also wanted to get more power from the engine. So I ordered a Rising Rate Fuel Pressure Regulator (RRFPR), bigger injectors, and APC - Stage II box. After talking with Gary at Swedish Dynamics, I ordered a copper exhaust gasket, red series cams, and a 20 psi blow off valve. 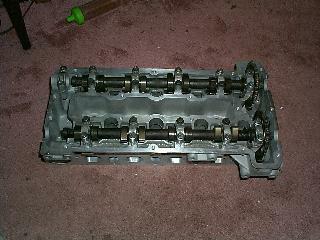 I think biggest difference actually came with the red series camshafts. The engine pulls all the way to the redline much faster than before. In reality this mod should be the last checkbox on your list. There are plenty of other things you can to gain power before going this route. A bigger intercooler, bigger turbo, injectors, and a proper fuel chip should come before this upgrade. Additionally, some people argue that the 2.0 head can be ported to flow just as much air as the 2.1. I'l leave this research and decision up to you!